As an artist and former jockey of 16 years, I have a passion for painting horses, thoroughbreds, racing scenes, and a large variety of subjects. I was born in Trinidad, Colorado and grew up 27 miles west of Cheyenne, Wyoming. My Grandfather, the only horseman in the family at the time, introduced me to horses at a young age. Following high school, My father convinced me to delay my racing career in lieu of higher education. I went to Casper Junior College, in Casper, Wyoming and majored in art. After finishing school the thought of making my lively hood as an artist, was not as appealing as becoming a jockey. I pursued becoming a jockey with a passion. Three years later, I was riding at Centennial Race track in Littleton, Colorado. I spent the next ten years, successfully racing thoroughbreds at major tracks in the west and mid-west. In 1983, a bad racing accident interrupted my career for a year and a half. The surgeon said my right leg was crushed from knee to ankle, I did not know if I would ever walk again, much less ride. I used the recovery time constructively by taking drawing classes at a local art college in Phoenix, Arizona. The doctor told me I would never ride again. But, the lure of the horse was still more powerful, and after a year and a half of physical therapy I recovered and returned to racing for another six years. I needed to return to the racetrack because I needed to prove to myself that I could still perform as a Jockey. I knew I would leave the racetrack at some point, but I wanted to walk away from that part of my life with my heart complete. 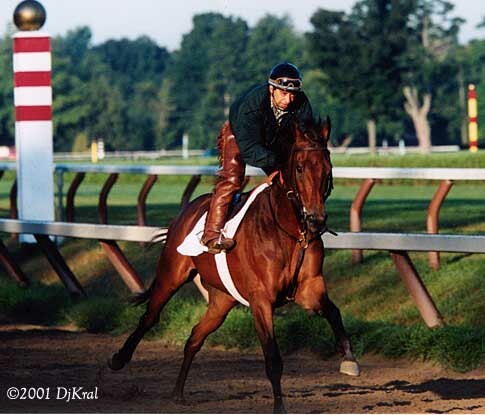 In 1991, I stopped racing but continued to be an active exercise rider for morning workouts at the racetrack. This allowed me more time to pursue a career as an artist. 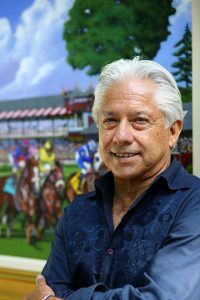 Entering the second decade of my career in art, I continue to reach audiences as an artist at the Saratoga Race Course and I have paintings in collections worldwide. My portfolio has grown to include African wildlife, landscapes and imagery from Saratoga, New York where I currently reside.